First-time buyers are dealing with a variety of obstacles when entering the market. These run the gamut from student loan debt to saving for their down payment. However, according to the report, a lack of education is the underlying problem, as 80 percent of surveyed non-homeowners believe they need to put down 10 percent or more when purchasing a home. And while affordability issues remain a constant struggle for first-time buyers, those surveyed reported that finding the right home was the biggest challenge—a problem that arises due to limited inventory. It's not all challenges when it comes to home-buying. Thanks to loosening restrictions from lending institutions, it's easier than ever for first-time buyers to get a mortgage through special programs with low down payment options and low interest rates. One popular option is the Federal Housing Administration (FHA) loan, used by 34 percent of first-time homebuyers (up from 33 percent in 2016), according to the report. So, what are first-timers after when it comes to buying? 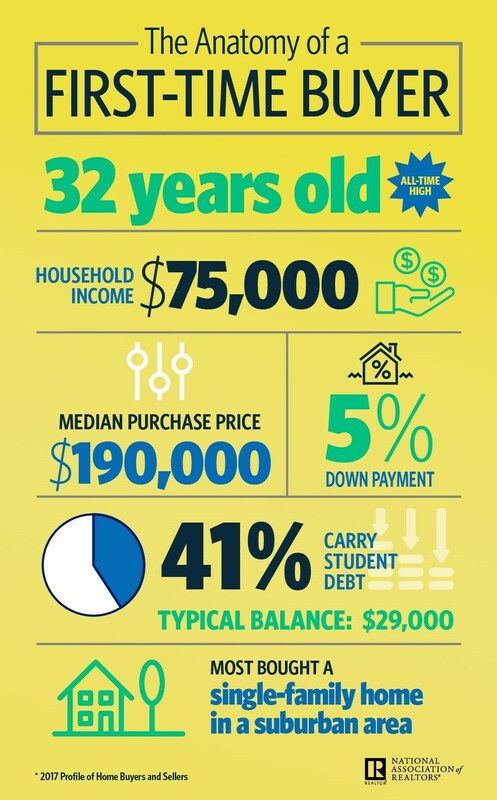 The following infographic provided by NAR—The Anatomy of a First-Time Buyer—breaks down the average purchase price, age, down payment amount and more of today's first-time homebuyers.